Dividend Stocks in India - How to find highest dividend paying Stocks? Home » Stock Market » Dividend Stocks in India – How to find highest dividend paying Stocks? The only thing that gives me pleasure is to see my dividends coming in. It is a popular quote by John Rockefeller American businessmen and one of the wealthiest person of all time. Dividend investing is one of the popular investment strategies. Dividend income can make you rich. You can even reach to a state where you need to work again. If it is sounding stupid let me give you examples. A famous equity investor of India Mr.Rakesh Jhunjhunwala is making enough income from the stock dividend. He can easily live off from dividend income. Another example is Investment Guru Warren Buffett. Warren Buffett is also earning decent dividend income. I know it is difficult and everyone may not be capable of generating income like this from the stock market. However, one thing is sure that Dividend Stocks and dividend income plays a vital role when it comes to stock market investing. Dividend income also helps you stand against a longevity risk. A Longevity risk is a potential risk of increasing life expectancy and no money situation in later life. One solution of addressing longevity risk is buying insurance and second is generating a never-ending income stream. I would recommend the second solution. So, if you have already started working towards passive income and planning to build dividend income by investing in some good dividend Income stocks. 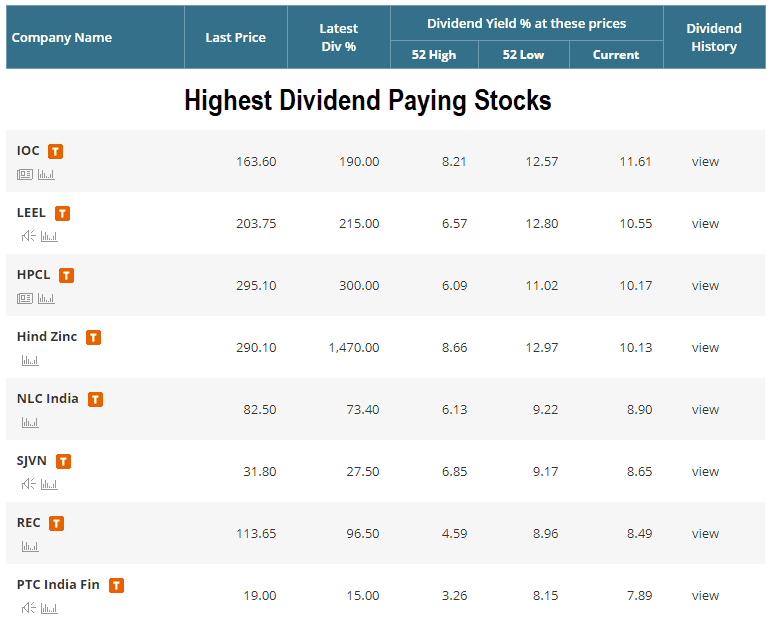 Here is a list of highest dividend paying stocks in India. Prior to disclosing dividend stocks let’s discuss dividend yield, calculation of dividend yield and How to find the highest dividend paying Stocks? A dividend is a pay-out by the company to its shareholders on a regular basis. It is a distribution of a portion of a company’s profit among shareholders as decided by the board of directors. A dividend can be issued as a cash payment or as shares of stock. What is dividend yield and dividend yield calculation? A dividend yield is a financial ratio. It is a measurement of cash dividends paid out to the shareholders relative to market price per share. A formula for the calculation of dividend yield is given below. Let’s try to understand this by example. Infosys stock price is Rs.1228 and dividend declared by the company for the year ending March 2018 is Rs.25.75 per share. This means a dividend yield of the stock will be 25.75/1228*100 = 2.09%. Higher the dividend yield means better is the company. This type of company shares a substantial portion of earning with investors. A dividend yield of one company is always compared with other company in the same sector to find out best dividend yield stock. Please note that dividend yield and %dividend are different. Dividend % means the ratio of the dividend given by the company to the face value of the share. After understanding dividend yield and dividend % let’s understand other important terms related to dividend. Cash Dividend – A money paid to the shareholder from company’s profit is known as a cash dividend. Dividend Declaration Date – A date when dividend pay-out will be declared by the company. Ex-Dividend Date: It’s the time between the announcement done and the payment of the dividend. It usually precedes the record date. Record Date: Record date is the date which is used to pay-out dividend to investors. For getting dividend, investor’s name should be present on records of the company as the holder of shares. So basically this date decides which all investors are eligible for dividend pay-outs. Why Dividend paying stocks are important? Dividend-paying stocks are extremely important for the long-term investors. Suppose you have invested in the stock for 5 years. Now, if suppose company is not paying any dividend you cannot earn money until you sell this stock. On the other hand, if a stock is giving good dividend regularly, you can earn regular income along with capital appreciation. So, it is extremely important to select a company which pays a regular dividend from the income point of view. How to find Highest Dividend Paying Stocks? There are multiple methods and websites to find out high dividend stocks. However, I recommend using following two websites. Moneycontrol.com is one of the best websites that provides complete information about Indian Stock Market. You can get complete information about any stocks on this website with a click of a button. Moneycontrol also features the highest dividend paying stock in the specific section. In order to access session of high dividend paying stock click on the link given below. Screener.in is a stock screener website that helps you to screen the stock based on criteria mentioned by you. The advantage of screener over moneycontrol is you can customize and add multiple filters while screening stock. E.g If you want to find a stocks list with consistent paying dividends and growing with the profit you can do that by customizing query as shown below. Note – Query given above is for example purpose only. You can customize this query based on your requirement. A list of Best highest dividend paying stocks in 2018 with most consistent dividend payment is given below. Who should buy Dividend Stocks? Dividend Stocks are best suitable stocks for the investor with low-risk appetite or those looking for regular income. These type of stocks are ideal choice for older or retired investor as a risk associated with these type stock is low. Even young people who want to balance the decline in stock price with dividend can also invest in such stocks. One should consider following things while investing in dividend stocks. A company should be maintaining a healthy track record of distributing a regular dividend. A dividend yield of the company should be higher. At least 7% or above (to beat inflation). One should look at growth along with dividend while investing in stock. High dividend stocks are not necessarily best stocks. Do independent research before investing in any stock. What is your take on the high dividend stocks mention above?